This article was first published by Spare Change News on June 14, 2012. BOSTON, Massachusetts—When Cecelia Young enrolled in her first course at Urban College of Boston (UBC), she didn’t know who would watch her youngest son while she was in class. Young was homeless at the time. Each night, she had been piling her 12- and 15-year-old boys into the car and driving to a friend or family member’s home to spend the night. They moved from house to house frequently, so as not to overstay their welcome and overburden their hosts. In the middle of that crisis, Young made a decision that she believes saved her life. She decided to go back to school. Three years later, Young has found her way to the other side of the dark. She has an apartment of her own in Randolph, a fulfilling job working as an emergency department assistant at Beth Israel Hospital, and as of this June an associate’s degree in Human Services from UCB. This year, UCB celebrates its 20th anniversary as an accredited, two-year post-secondary college offering low to moderate-income students the opportunity to pursue their associate’s degrees in Early Childhood Education, Human Services, and General Studies as well as several professional certifications. The majority of UCB students live in Boston’s traditionally underserved neighborhoods of Dorchester, Mattapan, Roxbury, and Hyde Park. Nearly all students work full time while taking classes at night. Many are immigrants; many are single mothers. All are considered “non-traditional” students. There are more than 50 colleges and universities in the Boston area and many of them welcome non-traditional students. However, only UCB offers a non-traditional education that actively supports the whole student, says Dean of Academic Affairs Nancy Daniel. Many students come to UCB with heavy burdens on their back. Helping these students reach academic success takes a great deal of additional support, Daniel said. “If we don’t look at [students] holistically, it’s not going to be a successful journey for them,” she said. Instructors try to prevent failure by spending time at the beginning of every course getting to know each student through writing assignments and group discussions, said Daniel. While most universities expect students to check their personal lives at the door, UCB faculty encourages students to share their experiences. What hardships have they endured? What barriers may make it difficult for them to complete the course? Whenever possible, faculty and staff at UCB offer to help shoulder some of students’ burdens so that they can focus on their coursework. Faculty may work directly with students to help plan how they will manage the course load. 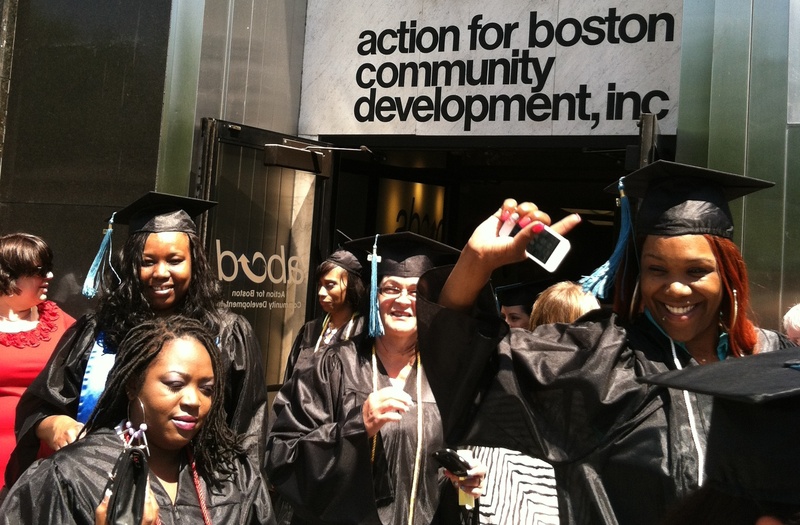 They may refer them to UCB’s caseworker or connect them with UCB’s parent organization, Action for Boston Community Development (ABCD) which provides homelessness prevention services, fuel assistance and childcare vouchers. “There are times when people need clothes; they need books but they can’t order online because they don’t have a credit card; they need a place to cry; they need five bucks to get home; they are hungry and they need food,” Daniel said. Whatever it is, she finds a way to help her students get what they need. It seems that the faculty and staff at UCB will do anything to help their students succeed, as Young described in her essay. During a pre-graduation ceremony, it became apparent that students extend that same compassion and sympathy toward each other. Students squealed in congratulations and traded hugs and tears of joy as classmates collected awards and honors commendations. As Taylor spoke, kids shuffled in their seats and a baby in the balcony began to cry, creating a symbolic soundtrack to the event. More than half of UCB students have children at home to care for while attending school and working full time, a feat that has garnered Taylor’s admiration. “Not only do you have the courage to go to college while you’re working. You have the grit to stick with it for several years while you balanced all the other responsibilities in your life . . . caring for children, managing a full time job . . . helping your kids with their homework. You read, you typed, you researched . . . you attended class until 9 p.m. at night, then you went home, put the kids to bed, and learned some more,” Taylor said. The payoff for all that hard work was evident as 105 supposedly unlikely graduates marched across the stage to accept their hard-won diplomas and certificates.